To learn more about the Society's holdings, search our online catalog  for the subjects that interest you, including politicians, political parties, government institutions, reform movements, and more. Visitors to HSP's library should also look for names and other terms of interest in our manuscripts card catalog , known as PC1 (and not available online), which serves as a name index for many manuscript items. To learn more about resources related to early political history, see HSP's subject guide to the Founding of Pennsylvania and the United States . The following is a small sampling of collections and sources available at HSP. Please contact a Reference Librarian  for further assistance. The Society holds papers of President James Buchanan , Vice President George Mifflin Dallas , Senators Joseph Sill Clark  and Josiah Stoddard Johnston , and cabinet members Salmon P. Chase , Joel Roberts Poinsett , Wayne MacVeagh (MacVeagh Family Papers ), William B. Wilson , and (on microfilm) Albert Gallatin  and William Wirt . There are small but rich collections of correspondence of U.S. Representative John Martin Broomall  of Delaware County, Pennsylvania, and U.S. Senator Pierce Butler (Butler Family Papers ) of South Carolina. Papers of other high federal officials in the collections include those of Assistant Treasury Secretary Tench Coxe (Coxe Family Papers ) and United States Bank President Nicholas Biddle (Biddle Family Papers ). The Francis Adrian Van der Kemp collection  and the papers of Thomas McKean , Charles Jared Ingersoll , Lewis S. Coryell , and Joseph Hopkinson (Hopkinson Family Papers , #1978) include correspondence with many 18th- or 19th-century national figures. Augustus James Pleasonton’s diary  discusses numerous political events between 1838 and 1844. The HSP collection of World War II papers  documents the late 1930s debate over U.S. involvement in the war. Although not a government repository, HSP has many government publications from the Commonwealth of Pennsylvania and the City of Philadelphia dating from the colonial period to the twentieth century. Such publications include legislative proceedings, committee hearings, statutes, case law, executive documents, constitutional convention proceedings, and the reports of departments, offices, and commissions. Try searching for your topic of interest in HSP's online catalog  to see what's available. The Hampton L. Carson papers  includes letters from Pennsylvania governors, judges, attorneys general, and others involved in the administration of law and justice. HSP also holds court dockets from justices of the peace in several Pennsylvania counties, including those of Joshua Barker , John Atkinson and George H. Rigby , and Henry Beader . HSP's collections document a wide aray of advocacy and reform movements. For instance, the political debate over slavery is represented through the records of the Pennsylvania Abolition Society , the Vigilant Committee of Philadelphia , and the Pennsylvania Anti-Slavery Society ; microfilm copies of the American Colonization Society  and Maryland State Colonization Society  records; and extensive pro- and anti-slavery printed materials. Collections documenting the struggle for women’s rights include the papers of suffragists Caroline Katzenstein  and Dora Kelly Lewis  and the records of the Woman Suffrage Society , Woman Suffrage Party of Logan , League of Women Voters of Pennsylvania , and League of Women Voters of Philadelphia . Labor movement-related collections include the records of the Philadelphia Typographical Union No. 2  and of the Workmen’s Circle Philadelphia District , the Ossip Walinsky papers , and a microfilm copy of the Morris Hillquit papers . There are also a number of labor movement newspapers, including Justice  (and its Italian-language edition, Giustizia ), Industrial Solidarity , Labor Leader , and National Labor Tribune . Materials documenting socialist politics include the James J. Cleary papers , the Forverts  and Morning Freiheit  newspapers, and microfilm copies of several collections, including records of the Socialist Labor Party  and the Socialist Party , papers of Morris Hillquit  and Darlington Hoopes , and newspapers such as Socialist Call , The Worker, The People, and Novyi Mir . A collection of Philadelphia County Board of Assistance papers  document the firing of public employees for alleged communist affiliations. Other political advocacy and reform initiatives are represented by the Indian Rights Association  and Pennsylvania Prison Society  records, and by the papers of Philadelphia Zionist leader Rose I. Bender , Japanese-American rights activist Sumiko Kobayashi , and African-American journalist/advocates James Samuel Stemons  and Justine J. Rector . The Herbert Welsh collection  documents a leader of the Indian Rights Association who was active in a wide range of reform efforts. The Leonard Covello papers  include correspondence with New York City reform political leaders Vito Marcantonio and Fiorello LaGuardia. The Philadelphia Fellowship Commission records  document a pioneering civil rights group after World War II. The Thelma McDaniel collection  comprises pamphlets and flyers from a range of civil rights, Black nationalist, and leftist organizations. The papers of Minnesota Populist and novelist Ignatius Donnelly  are available on microfilm. Far-right politics are represented by Imperial Night-hawk , Kourier , and Social Justice  magazines (all on microfilm) and by a number of Ku Klux Klan books and pamphlets, as well as government reports about the Klan. The Dennis Clark papers  contain extensive materials on Irish-American responses to the political struggles in Ireland and Northern Ireland. Several collections document politics related to Central and Eastern Europe, from pre-World War I independence movements to ethnically based anti-Soviet campaigns after 1945. Among these materials are the papers of Edward Behuncik , Charles Belohlavek , and Vladimir Hurban ; the records of the American Latvian Association in the United States , Baltic Women’s Council , and Polish National Alliance of the United States of North America ; and numerous books, pamphlets, and serials. 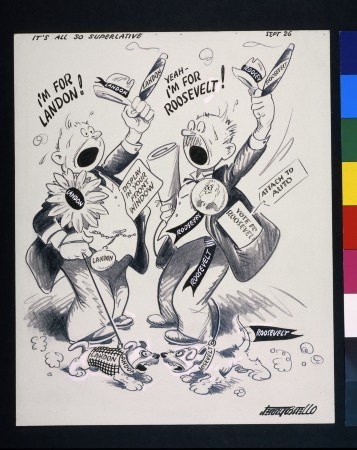 Political cartoons can be found in various collections at HSP, including the HSP cartoons and caricatures collection , the Balch Broadsides: Satirical Cartoons collection , the Hampton L. Carson papers , and the Pennsylvania Cartoons 1902-1915  scrapbooks, among others. Philadelphia political history is documented through the papers of several mayors, among them James Hamilton , mayor 1745-1746 (several small collections); Alexander Henry , 1858-1865; Joseph Sill Clark , 1951-1956; and Richardson Dilworth , 1956-1962. Other notable collections include a Philadelphia City Council minute book , 1789-1793, and the papers of City Council member Constance H. Dallas , Judge Nelson A. Diaz , and Tsiwen Law  of the Mayor’s Asian American Advisory Board.